Easily controlled by Wi-Fi using a Smartphone or Tablet, the latest Parrot AR.Drone 2.0 GPS Edition offers enthusiasts a classic camouflaged quadricopter, combined with a Parrot GPS Flight Recorder for the price of the popular Power Edition, representing a superb package deal for Summer 2014. Supplied complete with a distinctive desert sand style indoor and outdoor hull, plus one pair of black propellers and another customised pair of propellers to compliment the colour scheme. The exclusive GPS Edition packaging includes a GPS Flight Recorder, plus one 1000mAh lithium polymer battery to provide up to twelve minutes of flying time, and a convenient mains charger with international adaptors. Geolocate your Parrot AR.Drone 2.0 with the GPS enabled Flight Recorder, to keep track of its position, record your videos and review your flights modelled in 3D on the AR.Drone Academy map. The Flight recorder incorporates a 4GB built-in flash memory to store more than 2 hours of HD video plus flight data, with an easy plug and play USB connection. Select your destination on the AR.Drone Academy map, and make the AR.Drone 2.0 return to its take-off point automatically. By using the new Parrot Flight Recorder, the AR.Drone 2.0 became the world’s first flying toy with on-board GPS. This innovative accessory improves the stability and facilities of the quadricopter, records more than 350 flight settings, and is actually the black box of the AR.Drone 2.0. Featuring a high definition camera with a video recording facility, plus flight data sharing, a patented piloting mode, and an innovative pressure sensor for increased stability at any altitude, Parrot’s amazing AR.Drone 2.0 GPS Edition quadricopter can even perform four axis flips on command! 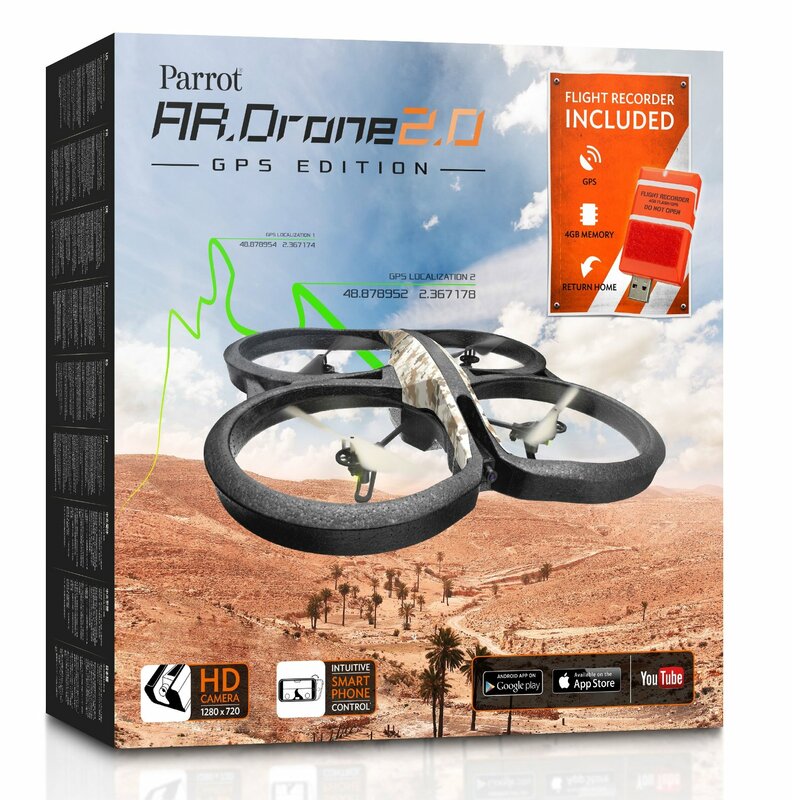 The Parrot AR.Drone 2.0 GPS Edition quadricopter, with a GPS Flight Recorder is available for a suggested retail price of £319.99 including VAT from all good shops. Get yours now!